In 1998, the Hands On’Semble released their self titled debut CD featuring guest performances by Pandit Swapan Chaudhuri (one of the world’s greatest tabla virtuosos), and by Poovalur Srinivasan (master of the south Indian mridangam). 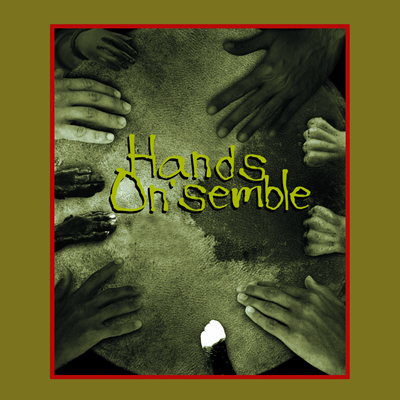 “The Hands On’Semble (John Bergamo, Andrew Grueschow, Randy Gloss, and Austin Wrinkle) are a California-based group specializing in hand-percussion music. Their self-titled CD contains a collection of of compositions that feature a variety of percussion instruments from around the globe, including the doumbek, riq, frame drum, sogo, tarine, gankogui, mridangam, kanjira, solkattu, and djembe. Most of the “tunes” are based on the musical traditions of India, Africa, the Middle East, and Indonesia. Many of the compositions are by ensemble members and contain both improvised and composed sections. The liner notes refer to each piece being in basic cycles, not time signatures. As such, “Wart Hog #3” is an undulating little vamp in 7; “Crevice” is an African/Indian sounding tune in 11; “Deep Dun-Dun” is a north Indian inspired tune in a cycle of 14; and “three Fro” is reflective of a gamelan work in a cycle of 6. “Frembe” lays to rest any notions that djembes and frame drums cannot create beautiful music together (as often argued by drum circle participants), while “Boon Rawd” is a result of the ensemble’s experimentation with metal instruments – including the Italian spaghetti pan, and the American mason jar. “The center of gravity clearly is Indian and Oriental rhythm without succumbing to cerebral exaggeration, the grooves are always exciting, and humor never goes short: They drum on spaghetti pots (why not, if the Indians do it on flower pots), Beethoven’s Hymn to Joy is presented on a Hungarian Jew’s harp. The impossible is made possible in the combination of two djembe drums with two frame drums by using expanded playing techniques. Indian rhythmics are applied to everything (African drums and bells, back beats, etc.) as a common denominator and never appear to be artificial. Thanks to short commentaries all the games are comprehensible; the two Indian teachers of the ensemble, Pandit Swapan Chaudhuri and Poovalur Srinivasan have splendid guest appearances. Surprising combinations of sounds and rhythms make listening a pleasure, the emphasis is on communicative group playing. John Bergamo, Austin Wrinkle, Randy Gloss, and Andrew Grueschow succeeded in presenting a CD clearly ranking among the most interesting percussion CD’s of the last ten years.” -Michael Weil, Percussion Creative, Germany.